This morning, I was sitting on the couch savoring a cup of coffee when I overheard Luisa say to Miguel, "Don't shoot her while she's sleeping." She said it casually like this is the type of advice that every parent gives out daily. It was a concrete reminder of how we have changed in the 13 years we have been parents. When Miguel was little, we had a no weapon policy. We made sure that all friends and relatives knew that we would not allow guns or swords in the house and that they shouldn't waste their money buying them. Every time we bought Miguel a Playmobil set, we removed any weapons that were included. The pirates kept their parrots and barrels of rum and the knight's had their horses and shields. If Miguel ever wondered what they needed those shields for, he never asked. Maybe he thought the shields protected the knights from the parrots. We didn't allow water guns. We allowed squirt toys but nothing shaped like a gun. 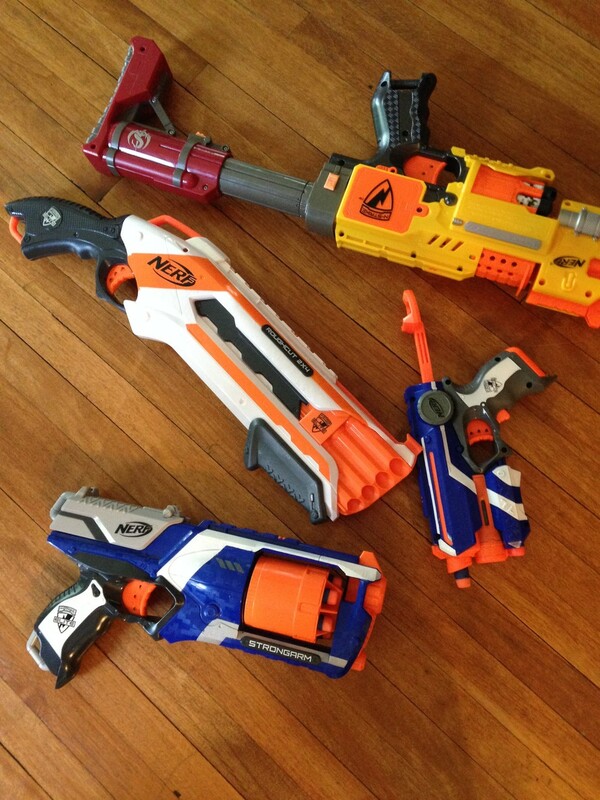 Then, a couple of years ago, we relented on the swords…and then the water guns…and just last year, the Nerf guns. And that is the slippery slope of parenting. Do not shoot your guns in the kitchen because I found a Nerf bullet on the stove. I'm tired of you guys arguing over bullets! If I have to ask you to do your chores one more time, I'm going to take those guns! I have also taken the kids to Target for more bullets so that Zeca could buy bullets because they resolved their Battle of the Bullets by deciding to share them. Community owned ammo is the way of the future, I guess. My feelings about guns have not changed, especially in light of the cultural context in which we find ourselves - school shootings, urban crime, the debate of the right to bear arms and gun control. I grew up in a household with numerous guns and remember seeing rifles in a corner of my dad's bedroom. He had handguns as well, some were collector's pieces (a pearl-handed Derringer for one) and some were for protection. He owned a bar and carried large amounts of cash home late at night after closing so he carried a gun. I remember going shooting with my dad and his friends - not at shooting ranges but at farms - and watching as they shot beer bottles off of fences. I even remember shooting the guns myself, my small hands gripping the gun tightly, my dad talking to me about kickback. There are good memories there and yet I hate guns and would never have one in my house. When my dad died, he left me one thing - his 22 Beretta - and I never took possession of it. I know there are responsible gun owners and I do not judge. I simply do not feel comfortable with guns, even in toy form and yet, my kids spent the morning treating our living room like the O.K. Corral. When Miguel started elementary school, he wanted to wear camo print shorts and we refused to allow it because we didn't like the image of a little boy dressed for war. He asked if I really believed putting on a pair of camo shorts would change him. It was a valid question and I bought him the shorts. This is how it is with parenting. You start out with ideals and things shift and change - you shift and change, impacted by these young people you are raising. Maybe the important part of the parenting is the conversations we have about these things. That's my hope because if you give a kid a sword, he's gonna want a water gun and if you give him the water gun, he's gonna want a Nerf gun and if that happens, remind him not to shoot his sister while she's sleeping.